When we were growing up Anthony and I had a very different lifestyle than our kids do now. Anthony and I were suburban kids with backyards and woods nearby, and Aidan and Quinlan are city kids with parks nearby. I was a kid who was outside and active a lot of the time. Sure there were times that I preferred to be inside reading a book, but the majority of my childhood was spent outside, playing in the backyard, or swimming, skating, biking, playing in the woods and climbing trees. With the amount of time I spent in trees you would never think that now I have a great fear of heights, but spend time in trees I did. We also were very close to our elementary school, so we played pick up games of softball, and played soccer wherever we could. Anthony was one of those boys who skateboarded, and road his bike recklessly down hills and off homemade ramps. He was also sent out in all weathers to play in the backyard. Our kids have a very different life, but one that is active. We do not have a backyard, but we live in a very walkable part of the city. Both boys take swimming lessons and have since they were small. 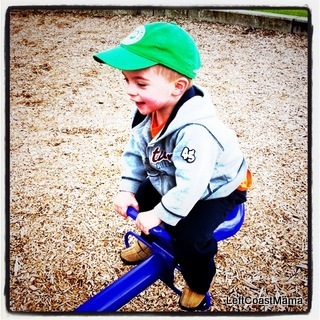 We spend a lot of time at the playground. We walk to school as often as we can. Last year Aidan took skating and skiing lessons and he and Quinlan will do so again this year. We walk down to Aidan’s theatre classes every week. Quinlan has started ballet. All of these things are good things, active things and they love to do them. Anthony and I also model active behaviour. Anthony commutes to work by bike. I walk everywhere with the kids. Most weekends we go geocaching. I think that geocaching as a family has brought about more activity in the last 4 years than anything else. Most weekends we explore a new park and walk or bike around to find new geocaches. It is a chance to get out and about and explore new places. 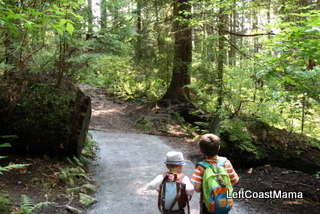 You would be amazed at how many small and big parks are in and around the Lower Mainland. When we go to a new city to visit, we cache to find different places and have other places to walk around. When Healthy Families BC asked me if I would help them with their social media presence and get the word out there about their website I was happy to do it. The website is intended to be a starting place for having a healthier lifestyle, and the blog is full of great tips in exercise and healthy eating including some fantastic recipes. To help promote� their twitter (@healthyfamilybc), facebook and website, Healthy Families BC is giving away a $250 gift card to Lululemon here on Left Coast Mama. You must either follow Healthy Families BC on twitter, @healthyfamilybc, or like them on facebook, then comment here letting me know you did.� If you do both, please put them in one comment and I will count it as two entries. Entries must be received by Monday 19 September 2011. I will contact the winner by email and the winner will have 48 hours to respond. The card will then be mailed to the winner as soon as possible. I am not receiving anything to run this contest. I think that promoting a healthy lifestyle is a good thing and I am glad to help. I follow on both twitter and fb. Great contest! I am following on both! I follow Healthy Families on Twitter. I follow Healthy Families BC on Twitter(@calidreamin87) & I like them on Facebook(Deanna Cali). I’m following on Twitter @jessamc! I like Healthy Families BC on Facebook and and am following Healthy Families BC on Twitter. I like Healthy Families BC on facebook and I follow it on twitter. Following on twitter and facebook! And happy to be back in Vancouver after 10 fun years in Toronto! I’m following them on twitter and liked them on facebook! Thanks for putting on a great giveaway. 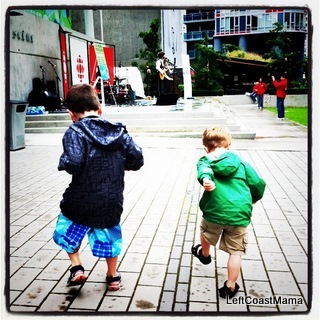 This was a great post too, many of our friends with kids are raising them in an urban environment as well, and are enjoying all the activities walking distance to them that they can do as a family. I’m following Heathy families on twitter! This is a great great giveaway! I follow them on twitter ( @IanYeung ) and I also liked them on facebook ( Ian Y ) Hopefully I win this fabulous prize!!! I followed their twitter account @Stevenwai . PLEASEEEEEE PICK MEEEEEEEEEEEEEEEEEEEEEEE!! Squeaking in at the last moment, I’ve liked healthy families bc on FB and followed them on twitter. I’m @mumamour. Here’s hoping to do some lulushopping and learn some great healthy family tips!